For kids, summer camp is a right of passage. And for many working families, it’s the answer to child care during the summer months. But with so many options out there, where do you start when it comes to planning summer camp? 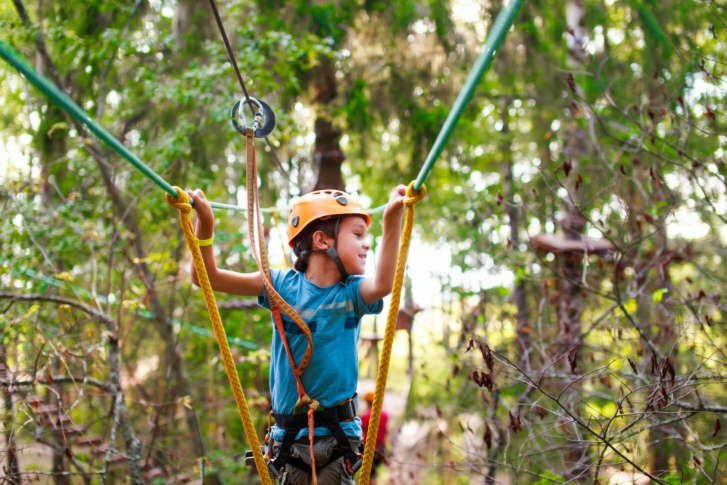 WASHINGTON — For kids, summer camp is a right of passage. And for many working families, it’s the answer to child care during the summer months. But with so many options out there, where do you start when it comes to planning summer camp? Parenting expert, author and blogger Leslie Morgan Steiner, shares some of her best tips for navigating the costs, concerns and logistics associated with sending the kids off to camp. #1: Camp doesn’t have to cost you. These days, there is a camp for everything — space camp, anyone? — and while the options can be overwhelming, so too can the tuition rates. But Morgan Steiner says signing your kids up for camp doesn’t have to require a loan. One way to cut costs is to turn to the other parents in your neighborhood or at your child’s school and organize a casual camp. Each parent can take a week to be in charge of the kids and their schedules. “Some employers will give people a half-day or a day off, or something similar in the summer, and if you guys can pool your free time, you can do sort of a sharing situation,” Morgan Steiner said. There are also a lot of low-cost camp options, such as those run by community centers, Boys & Girls Clubs and elementary schools that tackle sports and arts and crafts. #2: Put your schedule first. If the reality is that you’re piecing together multiple day camps throughout the summer, scheduling out the weeks can be a downright nightmare. Morgan Steiner’s best piece of advice is to be realistic. “As parents, we want somewhere wonderful for our kids, but we also have to remember that it’s got to work for the entire family,” she said. And remember: Don’t ignore logistics associated with travel and transportation — especially in the D.C. area. Morgan Steiner says you don’t want to ruin your whole summer by driving 30 miles twice a day for drop off and pick up. “Sometimes, it’s just best to pick a camp that’s a three-block walk, even if it’s not as adventurous and stimulating for your child,” says Morgan Steiner, who adds that more relaxed and casual camps can be a welcome break for over-scheduled kids. After you nail down your summer schedule, prioritize your kids’ needs and interests. Think about what they would enjoy and go from there. However, because there are so many different camps from which to choose, it helps to narrow the decision set for your child. “Instead of saying, ‘There are 100 options. What would you like to do?’ Pick three that you can live with and then ask your child which one they would like,” Morgan Steiner said. Another good idea: Let your child choose one camp focused on something they love, and then pick one in an area that’s new. “Especially if your kid is kind of shy or maybe needs a little push to be more adventurous, summer is a great time to do it because it is just a week commitment,” Morgan Steiner said. #3: To sleep away or stay? That is the question. Is sleep-away camp in the plans? Morgan Steiner says there are a few ways to know if your children are ready. The first is if they approach you about going. “Even if you’re anxious about it, let your kid go do it. If they’re ready to leap, your job is to be the net,” Morgan Steiner said. Another way to gauge their readiness is to look at how they’ve done at sleepovers with friends or weekend trips to grandma’s house. “If your child has a really easy time at sleepovers and you’ve never gotten a call in the middle of the night to pick them up, then maybe your kid is ready for a little bit more, and they’re ready for seven days away,” Morgan Steiner said. It’s more difficult when your child has insecurities or has a hard time being away from home, “because that might be the child who most needs to spread their wings,” Morgan Steiner said. Having a friend that’s been to camp in the past, or is going with your child, can help to put new campers at ease. Listen to more tips by downloading the full podcast.